Finding a good camera for the price may not an easy as it seems since there are so many of them in the market with numerous different range of capabilities for each users starting from camera for beginner to those with more experience. In today Canon 5D MARK IV vs Sony a7 III article, we are going to give you more information regarding what you can expect from them, so you will know which to choose. If you are interested in one/both of them, check our article below. For those who are interested in camera, the name Canon 5D series is surely one of the most well-known camera lines of the age and this Mark IV is designed to attract the attention of the same users of enthusiast and professionals. It looks almost the same as the older models but also planted with new or upgraded features, such as a higher resolution sensor with Dual Pixel autofocus and touchscreen. If you are looking for a good camera for a wider range of subjects from sport and wildlife to landscape, this one should be on your list. This camera comes in a medium-sized SLR style with a body made out of magnesium alloy measures at 151 x 116 x 76 mm and weigh around 890 grams with the battery, so it is a bit lighter than the older model. At the top of the camera, there are 3 buttons with the same function like mark III and moving to the back side, you will see a 3.2 TFT LCD screen, moreover, this screen is touch-sensitive. At the base, you will find a headphone and microphone port. 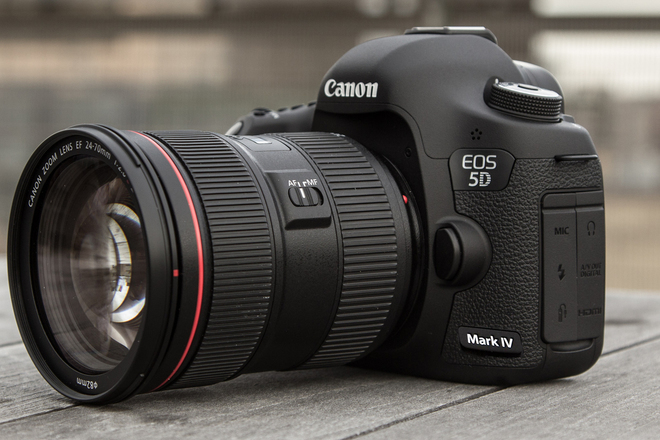 The Canon 5D Mark IV comes with a new 30.4MP CMOS sensor combines with Digic 6+ processor while the AF system is taken from the company 1D Mark II that contains 61 AF points, among them the 41 are cross-type. When compared to its older brother, this one is able to expand up to 24% vertical coverage unlike the older system. Another good new addition here is the capability to record video in 4K quality and the option to choose to record in either 24p or 30p. All footage you captured using the camera are Motion JPEG while it also allows 4K Grabs to give you that 30 fps stills shooting with the dual pixel AF. As it has been mentioned earlier, the AF upgrade is what make the camera a big deal for it comes with the company’s flagship sport camera AF. It borrowed the 150.000 pixel RGB-IR metering sensor from 1DX that will bring enhanced subject identification, tracking, as well as better metering and flicker detection. Another good thing you can find in 5D Mark IV is a nifty option that is proven to be useful in specific shooting scenarios, which is the Dual Pixel Raw. The feature works by recording two 30MP images from each of the left looking and right looking photodiodes at each pixel and result in a twice as large file but also allow for bokeh shift, image micro adjustment, and ghosting reduction. If you think that the 5D Mark IV is far too expensive for you but still want to find another good camera with a great capabilities, you may want to check on Sony a7 III mirrorless camera. The item is a very capable Full-frame camera even though it is labeled as a basic model. When compared to its peers in the market, it looks very appealing with a combination of features you can find in another model like A7R III and A9. Considering the fact that it is a full frame camera, we can say that this one is pretty light, even though it is a bit heavier than its older brother. The controls here are also quite similar but there are some things worth mentioning like the bigger battery for all day shoot, more pronounced rear dials and real jog dials, and better grip comfort. At the back, we can see a touchscreen LCD while now it also has dedicated AF-On and AEL buttons as well as joystick to control autofocus point’s position. Read also: Sony Alpha a7 III vs a7 II here. As it has been mentioned earlier, the a7 III comes with a 24.2-megapixel full-frame sensor and what’s makes it different from its predecessor is because it now used an entirely new chip that benefits from backside illuminated design. The company said this improvement will brings better noise response at high sensitivities and delivers an impressive 15 stops of dynamic range at its base ISO and allow the camera to take a vast amount of highlight and shadow information to be recorded in its 14-bit Raw files. Another noteworthy feature here is it comes with A9 extended ISO at 204.800 while the low end is ISO 100 and an extended setting that provide ISO 50, 64, and 80 are also available. The sensor here is still supported by Bionz X processor and the same front-end LSI that makes many Sony’s cameras able to shoot faster and handle vast volumes of data more efficiently. A7 III itself able to shoot continuously with autofocus and exposure adjustment at 10fps. If you are often taking fast-moving subjects, the improved buffer makes the camera able to take as many as 117 JPEGs, 89 compressed Raw files or 40 uncompressed Raw files in a burst. With its fully-electronic shutter, you don’t have to worry about disturbing your subject when taking their picture. 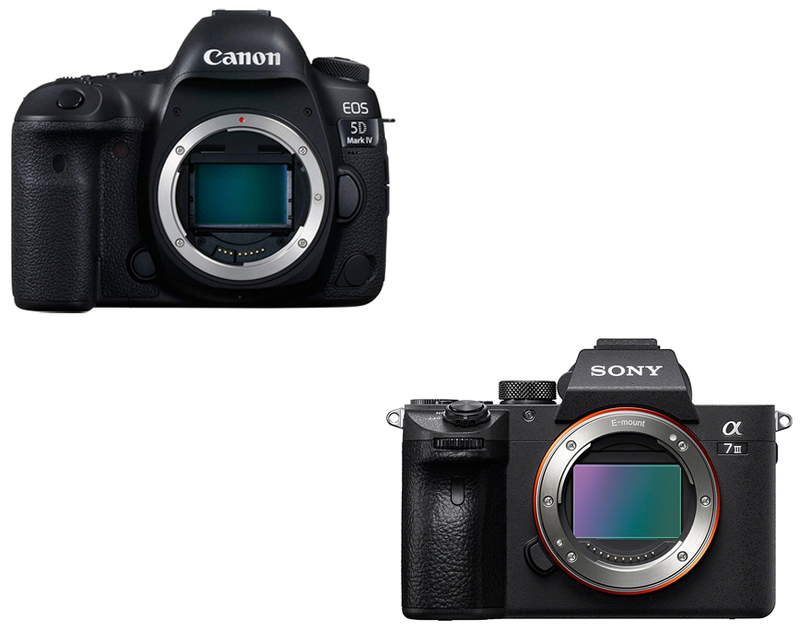 Now, let’s compare Canon 5D Mark IV with Sony a7 III. As you already know, from the features 5D Mark IV is clearly more powerful with professional set of capabilities that set it apart from basic model a7 III. One of their difference is the sensor because even though they are both Full Frame, Canon has 30.4MP CMOS with Dual Pixel AF and Sony has 24MP BSI CMOS. However, a7 III is also a very capable camera that can shoot continuously at 10fps while Canon at 7fps. All in all, the decision is all your to make. In our opinion, both of them are great choice, we know that Canon 5D Mark IV is a DSLR and the other is mirrorless. 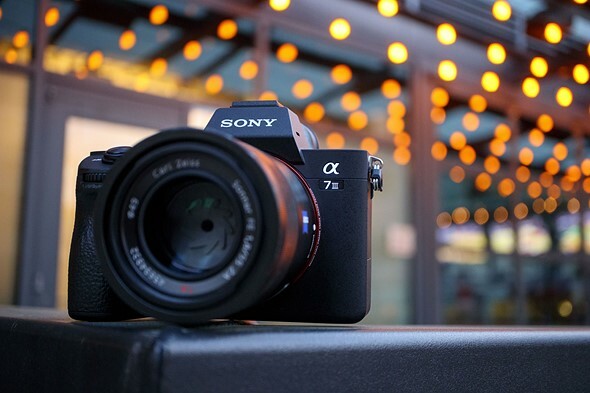 It is a well-rounded camera that suit a wide range of subjects, but if you are looking for an affordable choice with similarly powerful capabilities, we will recommend you the mirrorless Sony a7 III.